You arrive at the Jaipur airport/station for this adventurous journey. 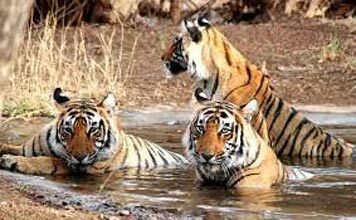 Soon after reaching, you will be taken to Ranthambore, which is around 145 km from Jaipur and takes around 2 and half hours to reach. Once you are there, you check in at the pre booked hotel and take some rest. After lunch, you set out for a safari ride into the jungles of Ranthambore National Park. Depending on the availability of the vehicle, you can take a ride on an open bus, jeep or a canter. This fun day sums up with a warm dinner and a comfortable stay over at the hotel. Today your jungle safari exploration takes a higher level, an early morning ride enables more chances for sighting the animals. 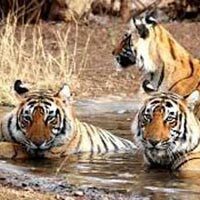 You explore the deep jungles of the National Park on an open roof vehicle, tracking for tigers. This mission lasts for around three hours, then you return back to the hotel for breakfast and spend the rest of the morning relaxing in the comfort of the hotel. Post lunch, your afternoon jungle safari continues into the Ranthambore National Park for wildlife viewing. In the evening you return back to the hotel to relax and after dinner, you retire for the night. In the morning, after the farewell breakfast, you visit the Ranthambore Fort. The Fort is known for the glory and valor of the Chauhan dynasty, it is huge and take around two hours to complete. Return at the hotel to check out and a drive to Jaipur concludes your adventurous journey. You are dropped to your specified stations and airport for your further journey.